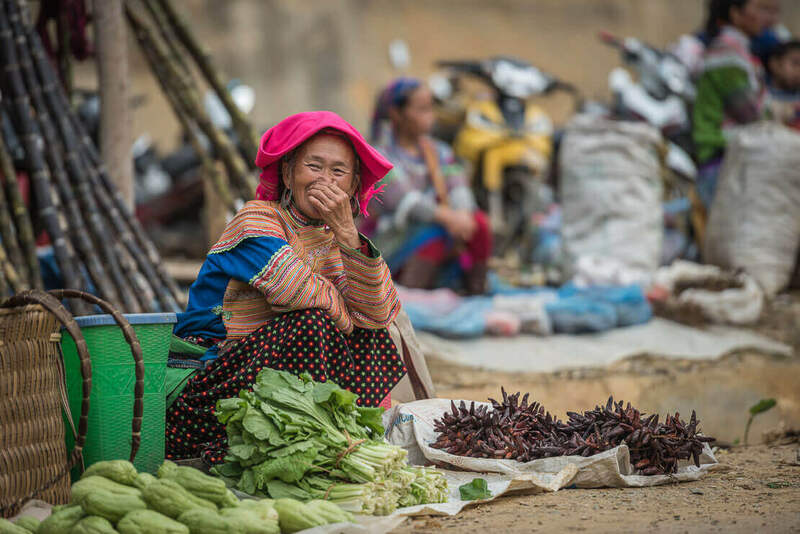 Can Cau market is a colourful local market in the North of Vietnam. 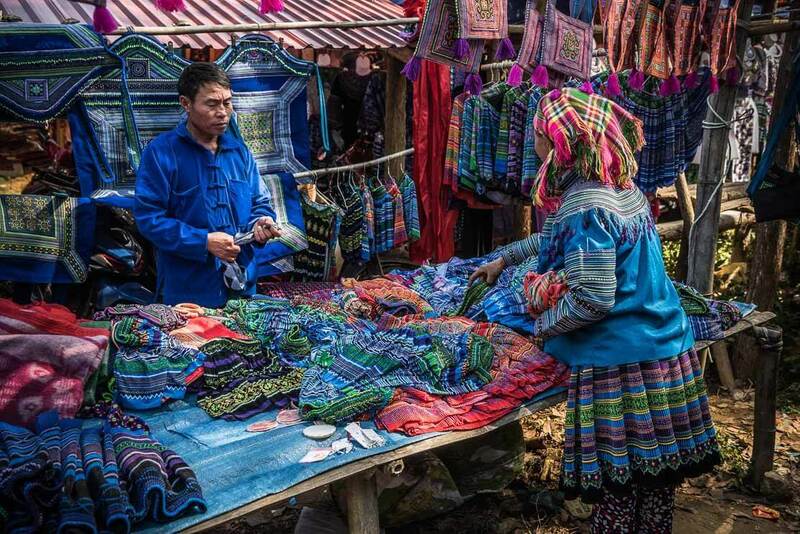 This authentic and bustling market attracts hundreds of ethnic minority people dressed in their stunning traditional clothes. 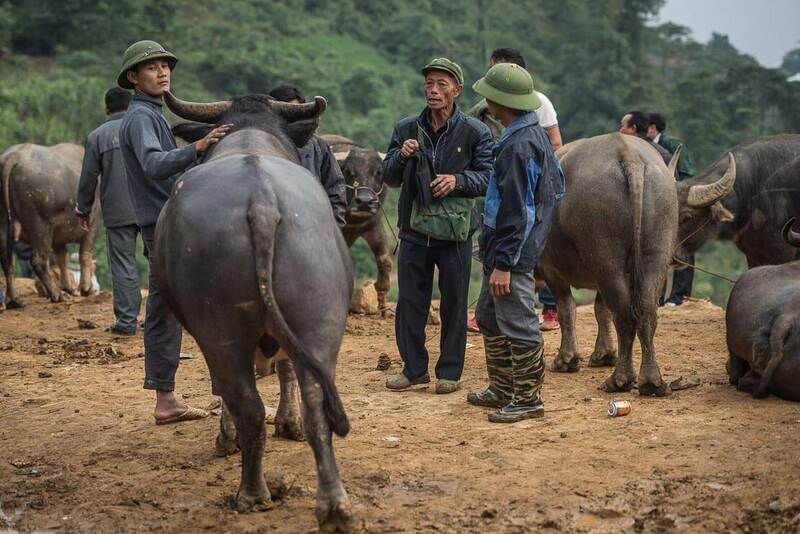 Can Cau market is also the largest buffalo market in the north-west of Vietnam, with hundreds of buffaloes are sale. “Be careful!”, a smiling young man is winking at us. A cloud of dust and yelling make us turn our heads. 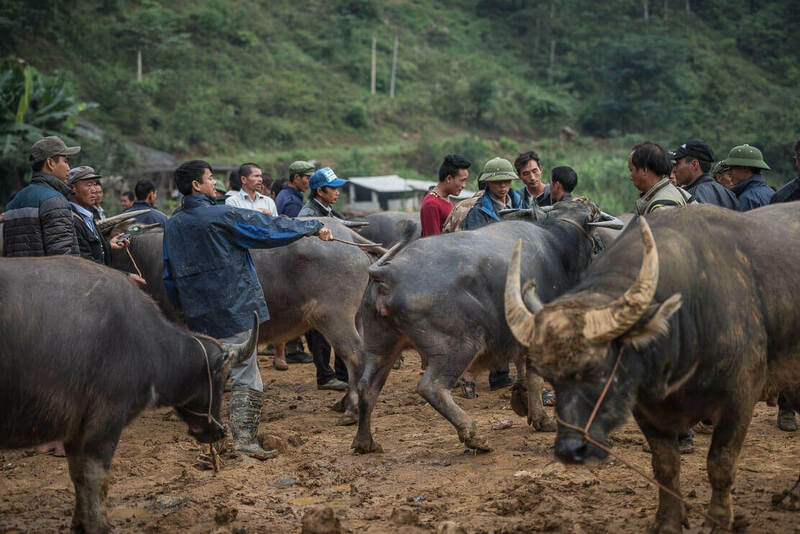 Two buffaloes are charging at each other right behind us – we are at Can Cau market in the North of Vietnam. 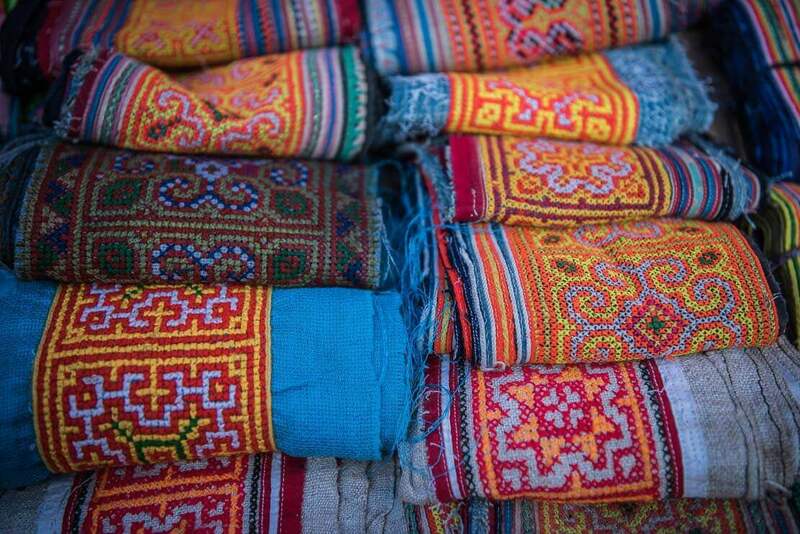 With the impact of globalisation, the traditional culture is barely surviving worldwide. The more remote the area, the higher the chances that the culture is alive. 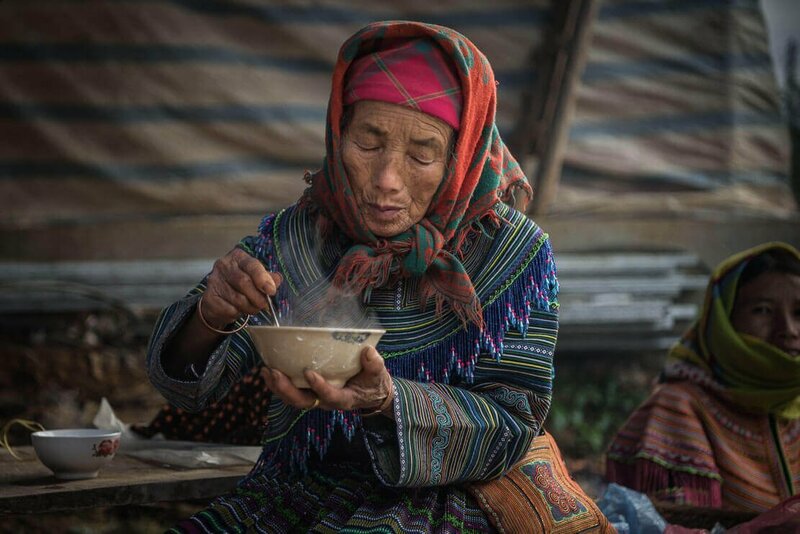 In the remote north of Vietnam, with its rugged terrain and difficult access, many hill tribe villages managed to preserve their culture, including their traditional clothes. 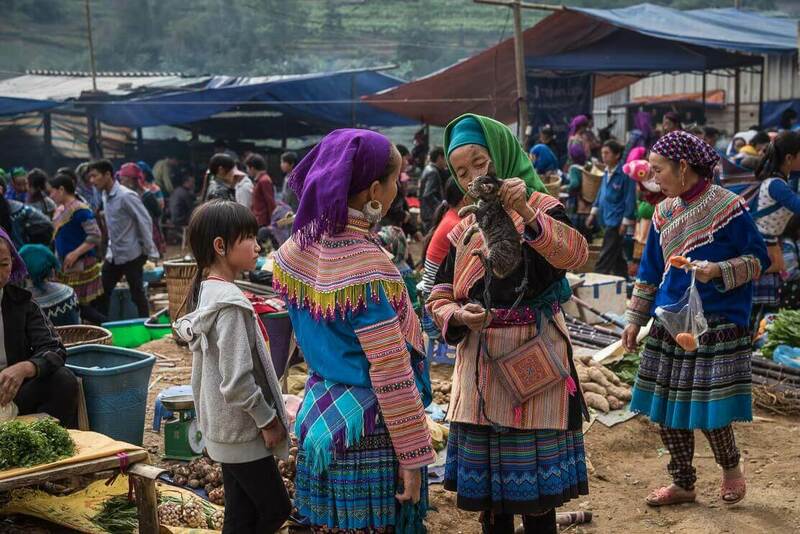 The best way to see its beauty is to visit local markets attended by the ethnic minority people from various remote villages. Can Cau market is one of these places. 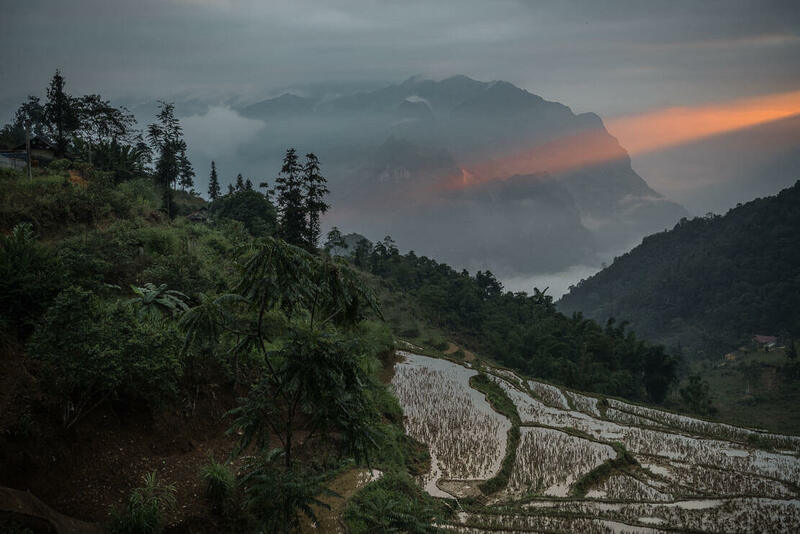 At 6am, when it’s still dark and cold, and fog densely covers the mountains and terraced rice fields, we are riding on our motorbike on the serpentine road from Si Ma Cai to Can Cau market. Whatever the weather, the market starts shortly after dawn. 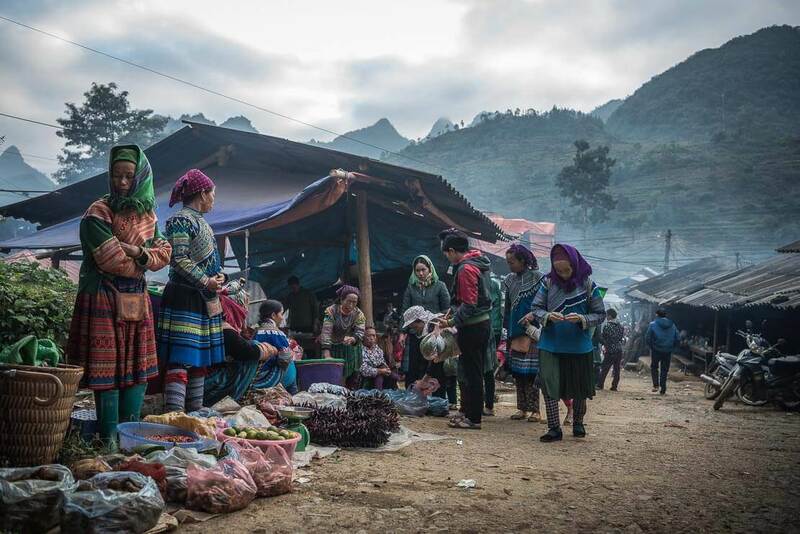 Locals start flocking to the market with the first light of the day. Some people walk for several hours but the distance doesn’t discourage them from coming to this important weekly event. 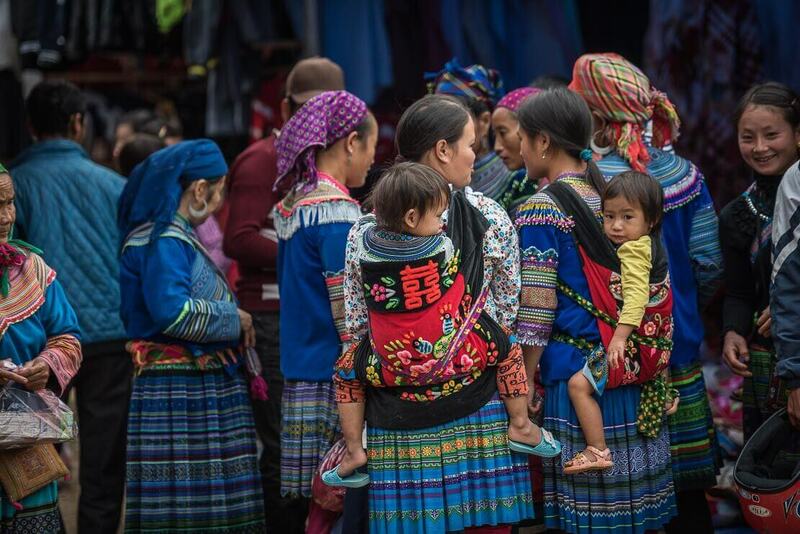 Can Cau market is the place to encounter many ethnic minority people. 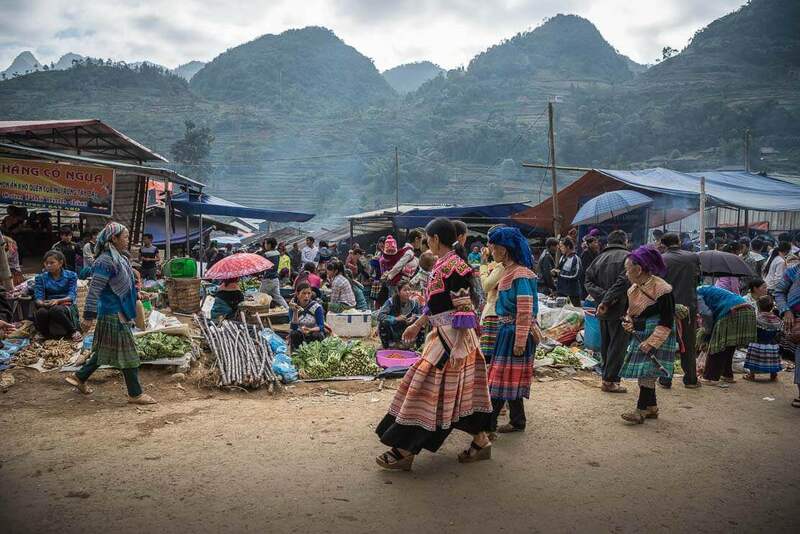 Located in the mountains near the Chinese border, Can Cau market attracts different ethnic minorities, mainly the Flower Hmong, the Blue Hmong and the Giay (pronounced “Zay”). 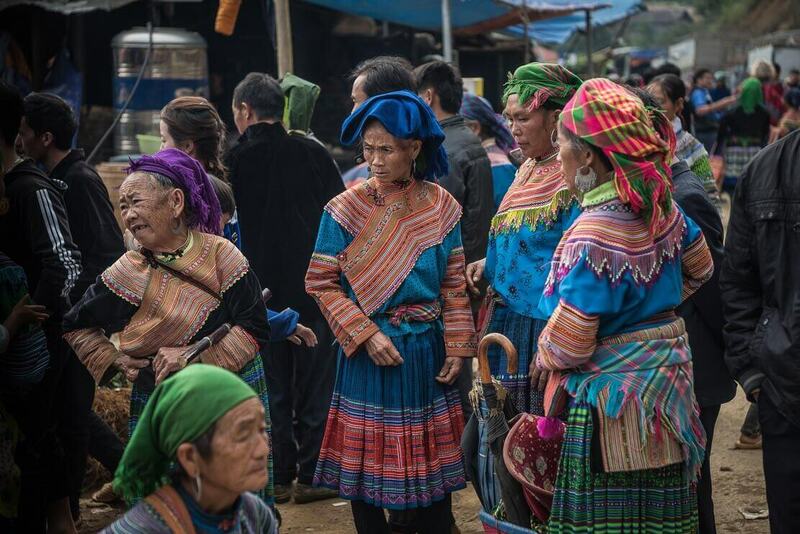 The Hmong are easily recognised by their colourful traditional costumes, predominantly orange for the Flower Hmong and blue for the Blue Hmong. Unfortunately, we didn’t see any Giay. 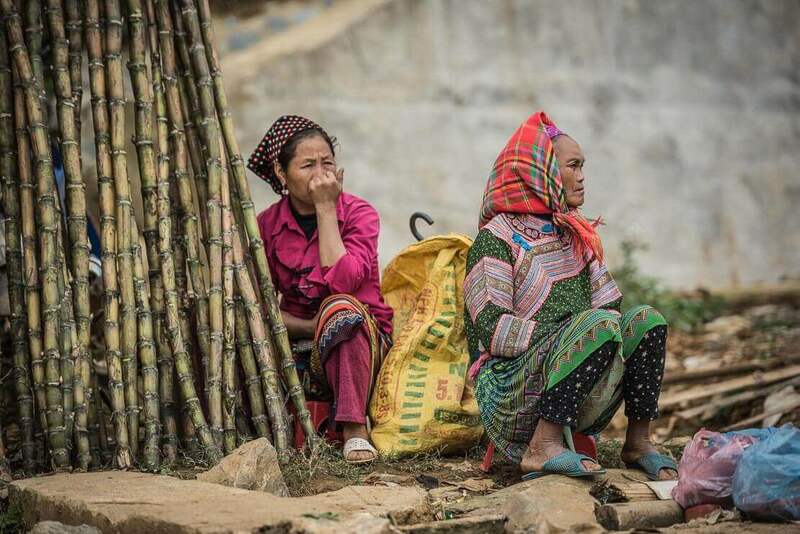 Or maybe they were invisible among the riot of colours of the Hmong. 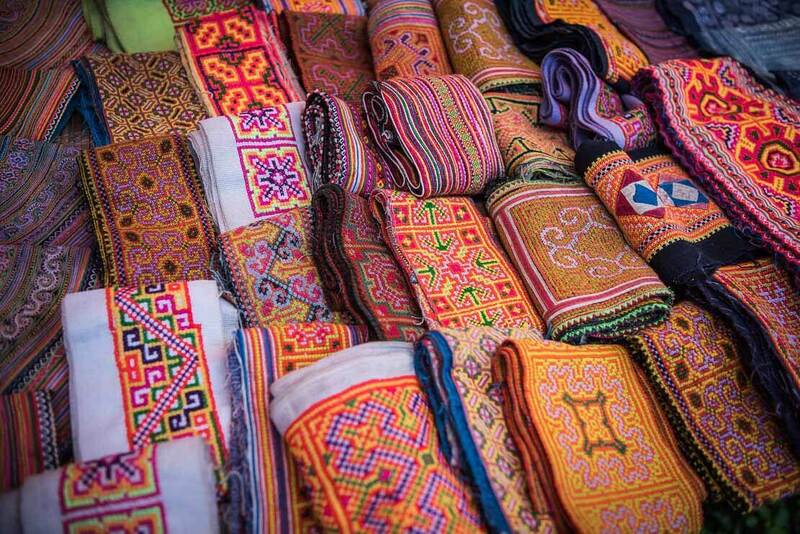 Hmong’s bright colours are everywhere – red, yellow, orange, blue… Not surprising as the Flower Hmong have one of the most colourful clothes among different ethnic minorities in Vietnam. 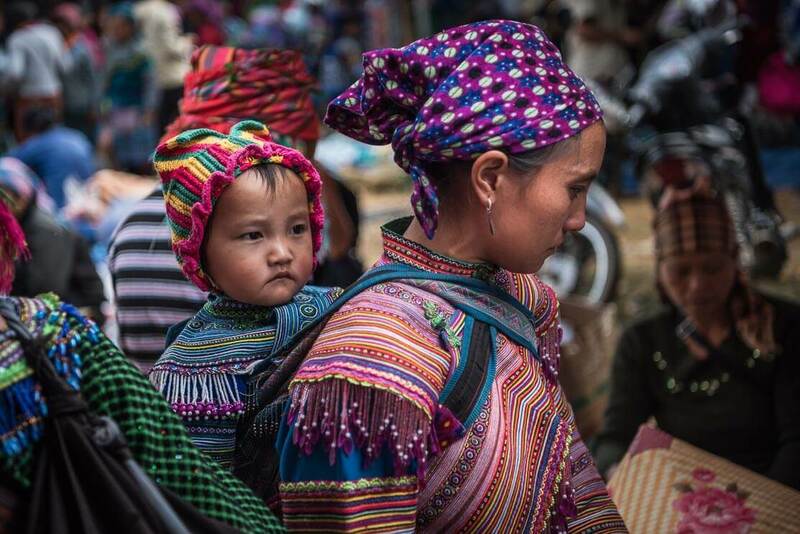 Traditionally, Flower Hmong women wear colourful embroidered blouses and skirts pleated with many meters of fabric and decorated with front and back skirt panels. The skirts’ length varies from knee to ankle. Some women wear long bouffant skirts and shoes on hills making them look very elegant. Olga feels somewhat clumsy in her fancy Gore-tex shoes. 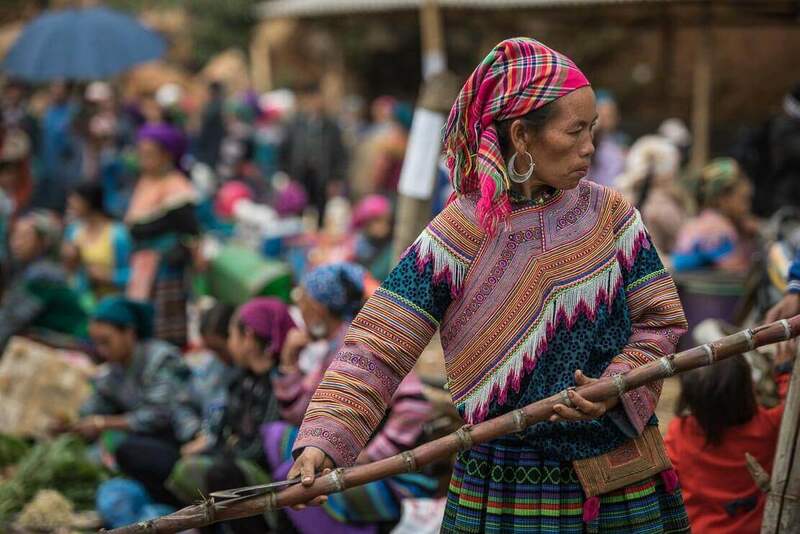 Flower Hmong women’ outfit also includes bright plaid headscarves and wraps on their calves, a strip of embroidered and colourful fabric wrapped from the knee down. 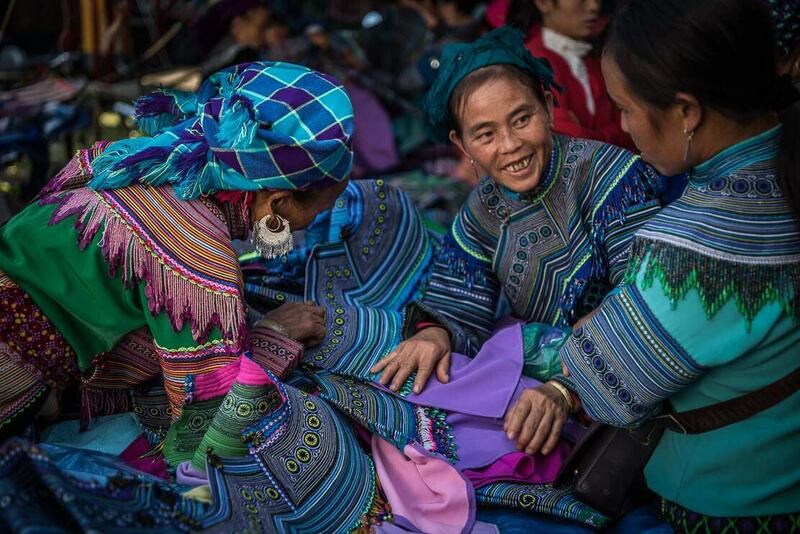 The Flower Hmong traditional attire could easily make jealous many fashion designers. 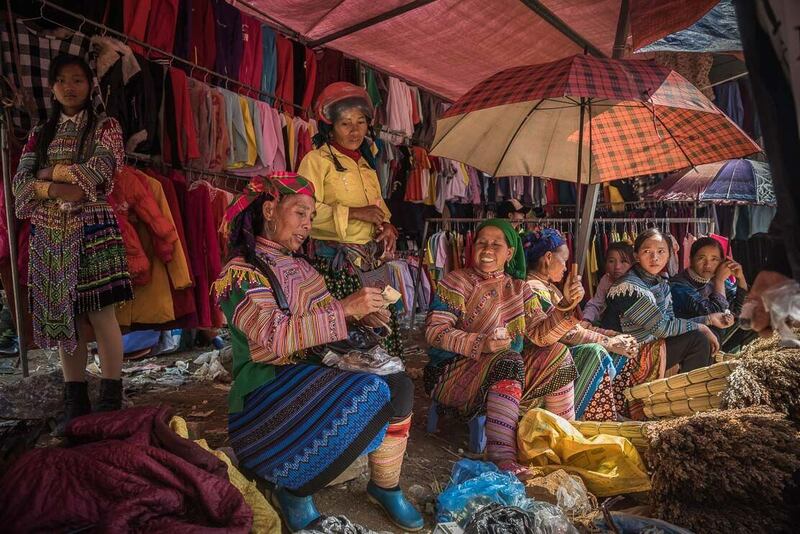 We are wandering around Can Cau market admiring ethnic minorities’ traditional clothes, and discovering what is on offer. 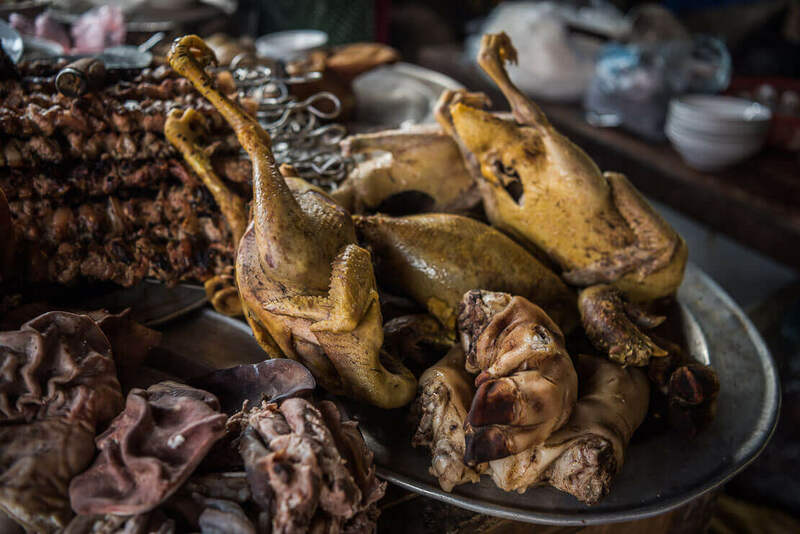 The market has all kinds of goods, including fruits, vegetables, livestock, clothes, fabrics, rice and corn wine and many other things. 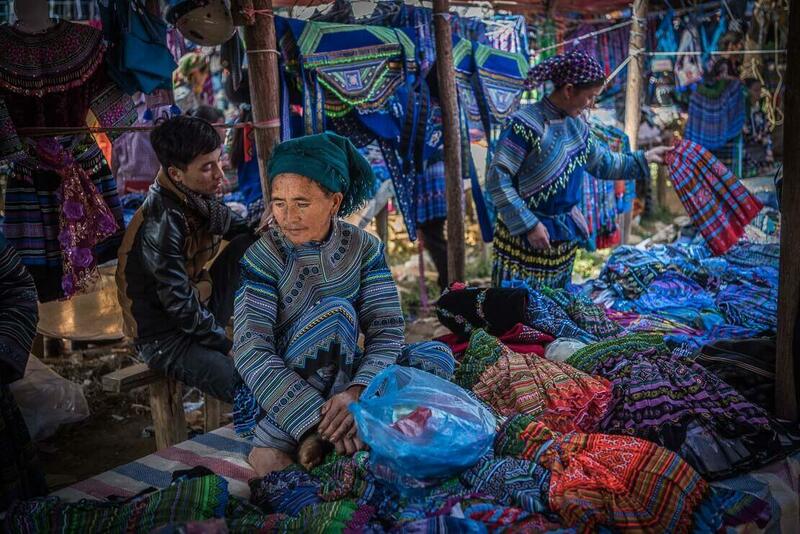 Most of the locals are doing their business and aren’t paying attention to us, except for a few business-savvy Hmong women trying to sell their colourful embroidered bags. Many women are busy buying clothing. They are meticulously picking traditional blouses, skirts, beautifully embroidered shirt collars, sleeves, wraps of all kinds, bags, purses, and jewellery. Unfortunately, traditional clothes are becoming a rare sight. 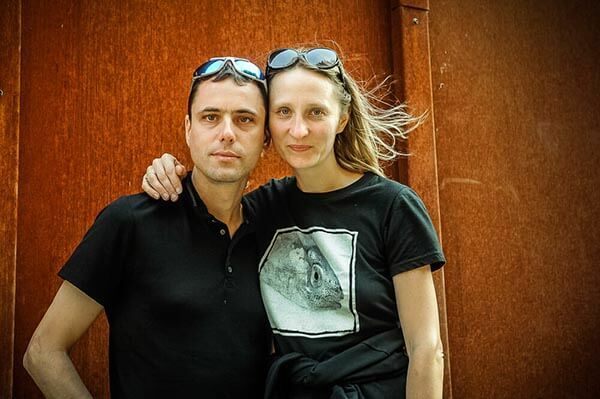 Machine-made synthetic clothes “Made in China” are all over the market. 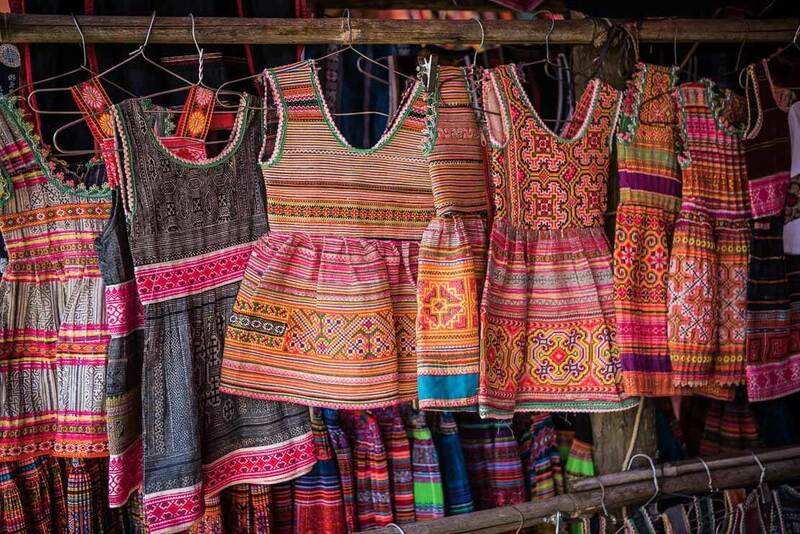 Traditional Flower Hmong skirts, pleated with many meters of fabric, are so heavy, hot and expensive to make that women easily trade them for cheap Chinese imitations. 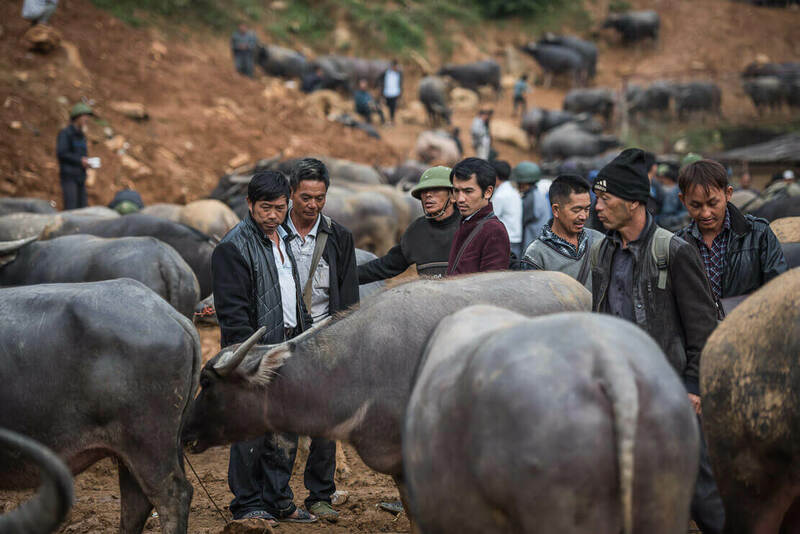 Can Cau market is the biggest buffalo market in the north-west of Vietnam. 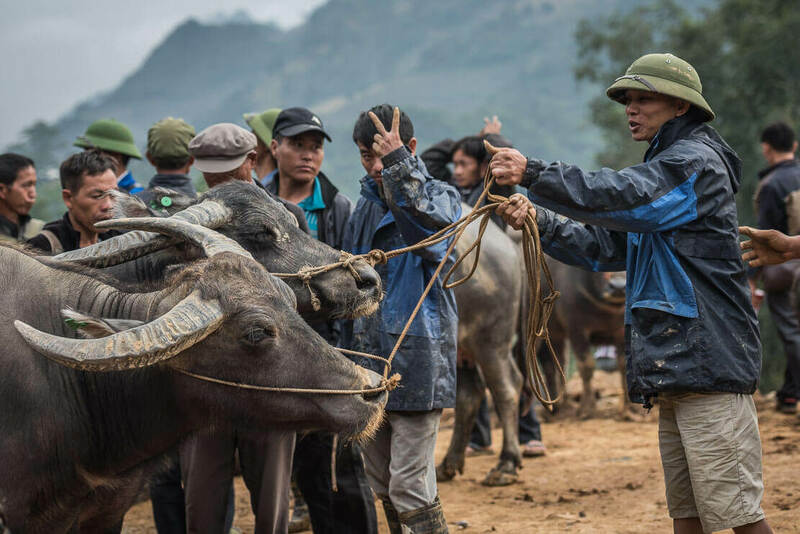 Can Cau market is known as the largest buffalo market in the north-west of Vietnam. Each Saturday it attracts hundreds of buffalo owners. 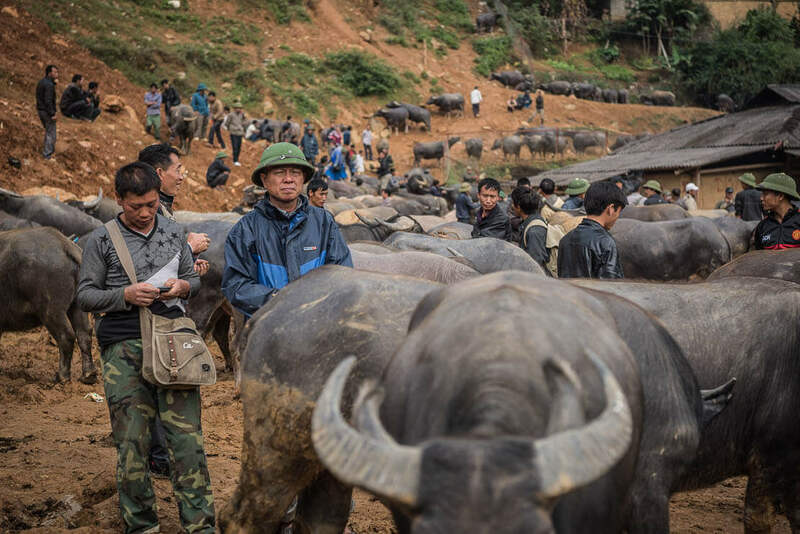 Around 7am, the buffalo area is already very busy and crowded with buffaloes, their owners and stocky buffalo dealers. The atmosphere is lively and vibrant. All of a sudden, we hear some noise and yelling. Just behind us, two hefty buffaloes are charging at each other. Locking horns and pushing each other, these usually slow and gentle-looking animals become real beasts. Looks like two hot-tempered males are seriously clashing. 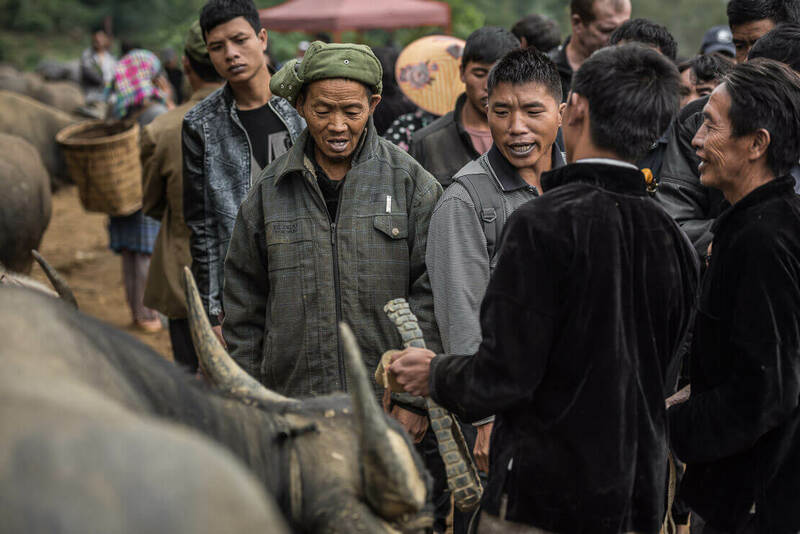 But as a local explains to us, there are occasionally organised buffalo fighting to test the strength of the animal before deciding on buying. The buffalo fighting is popular. It attracts the crowds, who take the best viewing (and the most secure) positions in anticipation of the fight. 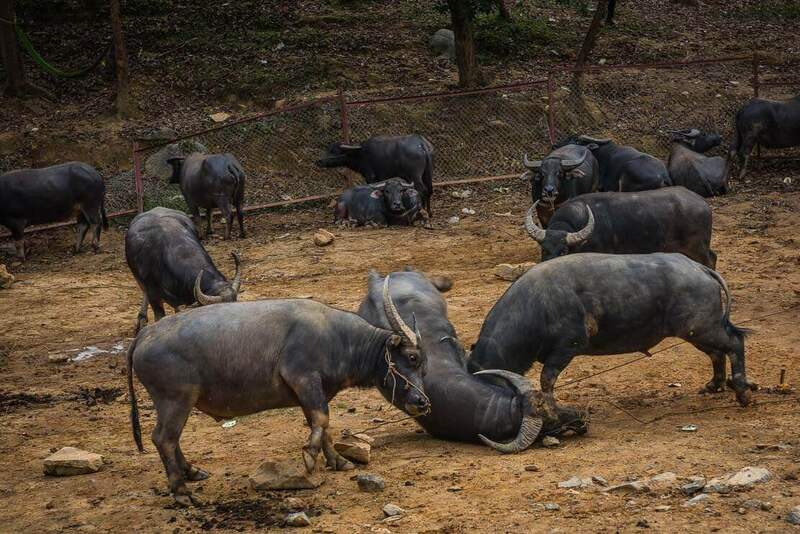 As for us, we just happened to be right near the fighting buffaloes! The fight was short, and once it’s over, the business is back to normal. Potential buyers are slowly moving around, leisurely but carefully inspecting the animals. Once they spotted a good one, the non-interest disappears from their face, and hard bargaining begins. 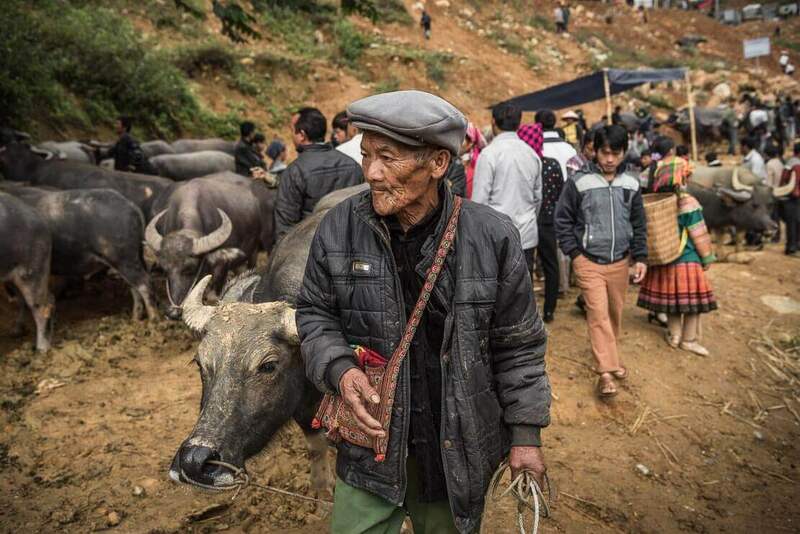 As soon as the price is agreed upon, and the hands are shaken, the happy buyer leads the buffalo back to his new home, and the ex-owner puts heavy packs of dongs in his pocket. A buffalo is expensive. 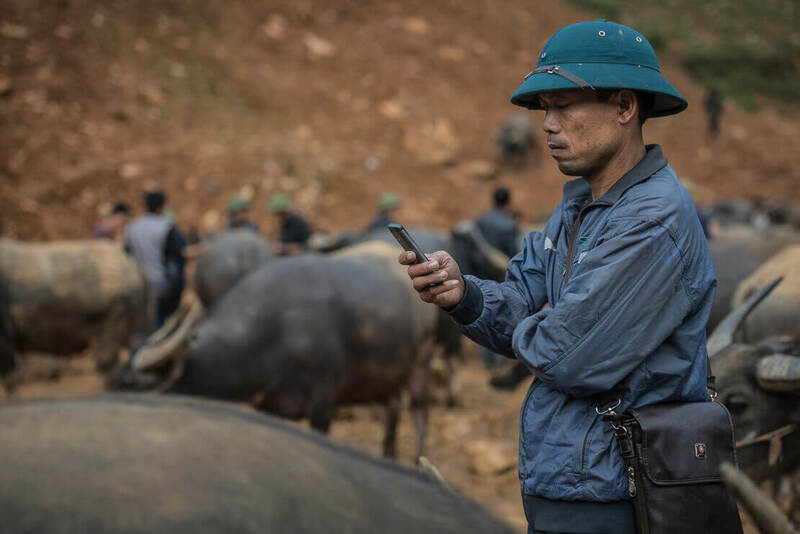 The prices usually ranges from VND10 million to VND20 million ($500 – $1,000) or even higher. 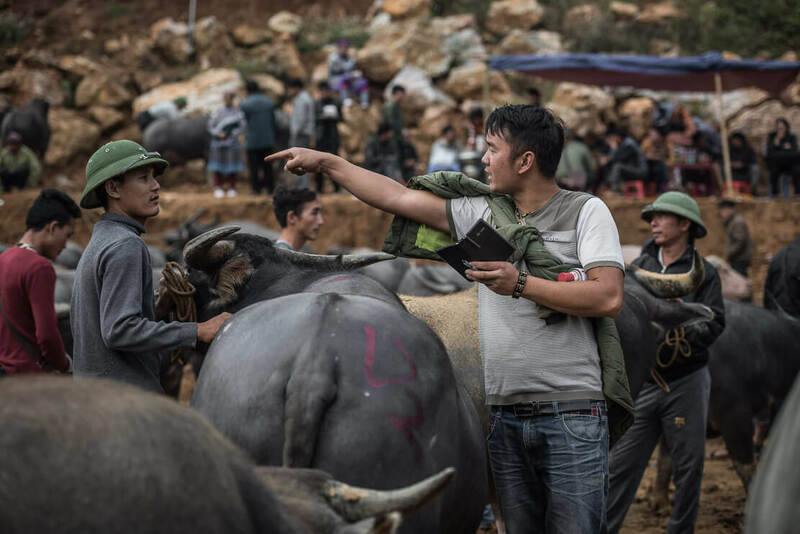 Many locals wait until the end of the market to buy the buffaloes left without buyers (with crippled legs, weak or too thin) at low prices so that they could fatten them up at home and sell at a profit. 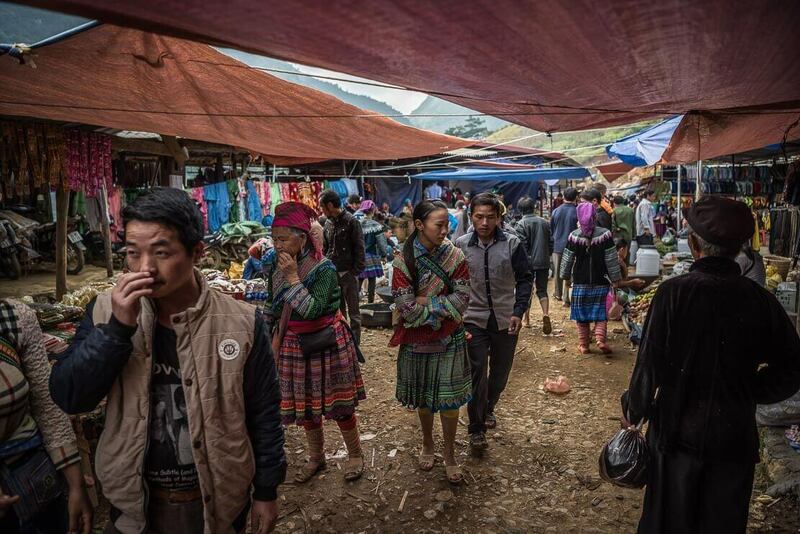 Different languages of the ethnic minority people are heard at the market together with some Chinese. 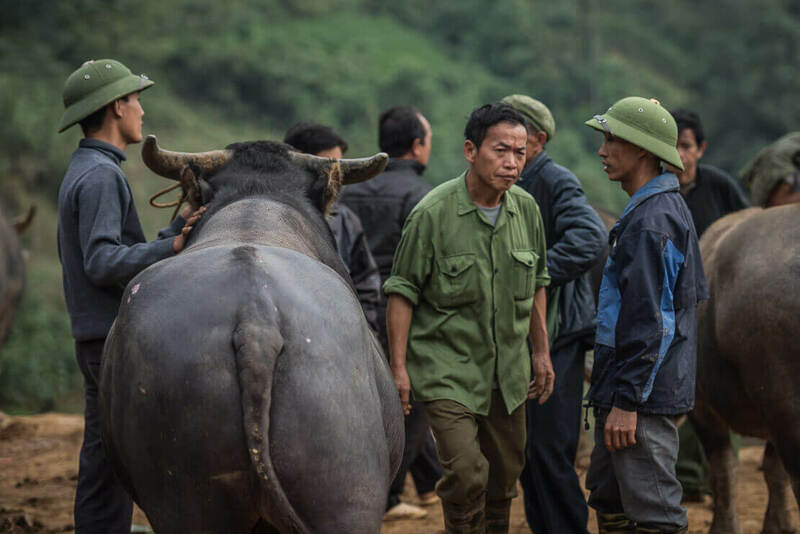 Can Cau market is just near the Chinese border, and Chinese dealers from Yunnan province come to Vietnam to buy buffaloes for meat to serve their Muslim community. 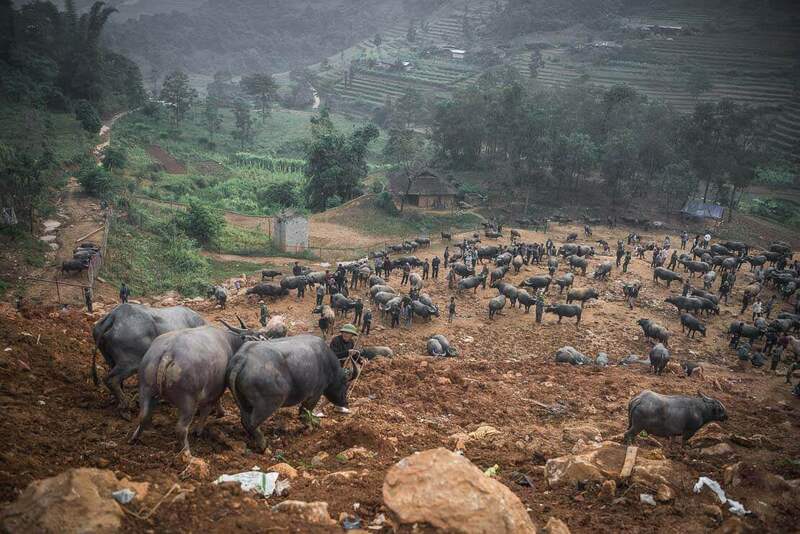 While Chinese dealers buy the animals for meat, the Vietnamese buy strong buffaloes for ploughing their rice paddies. 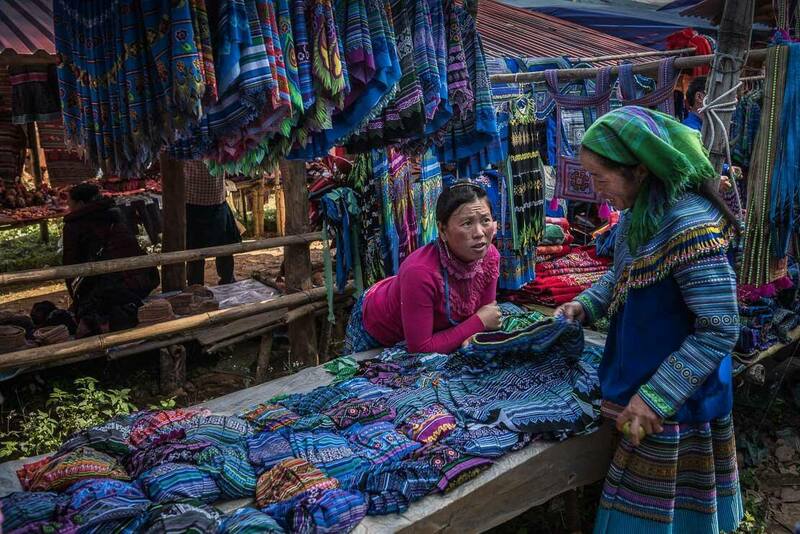 Among all this trade going on, some lively Hmong women are playing the role of money exchanger. 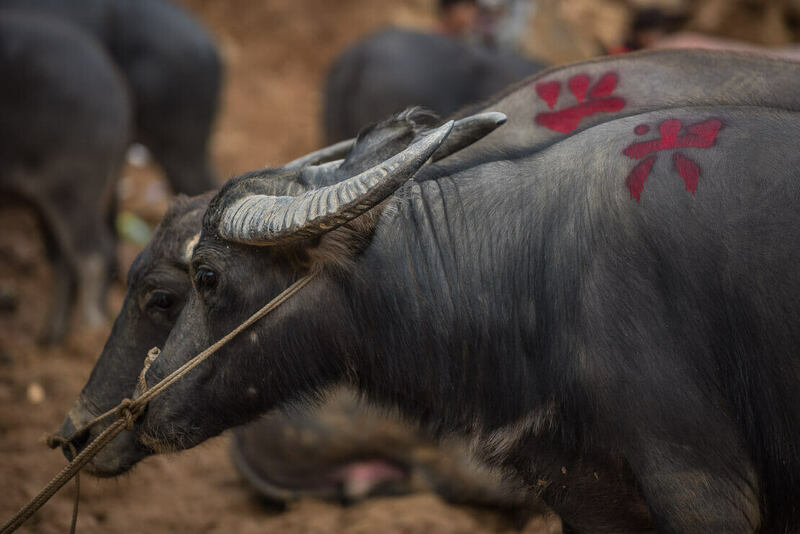 We recently visited Sanpatong buffalo market, one of the biggest buffalo markets in northern Thailand. 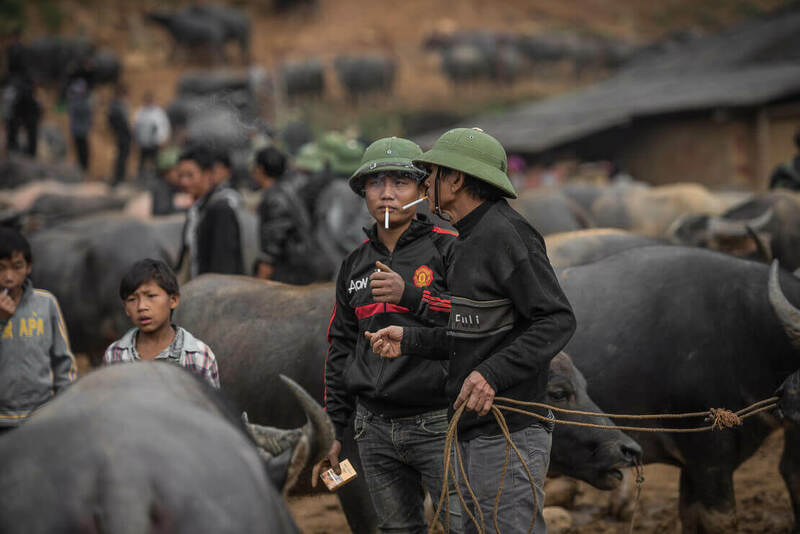 Although it’s all about selling and buying buffaloes, the two markets are different – the atmosphere, the vibe, the people etc. 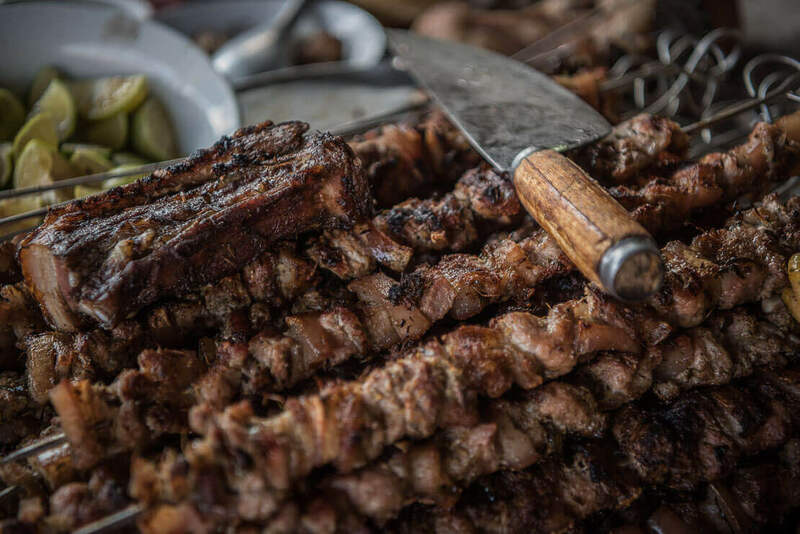 Can Cau market is the place to try some local specialities. After 9 am the market becomes even more chaotic and cramped. It’s crowded, noisy, and muddy. It’s full of colours, sounds, and smells. Choking smoke is coming from the grills of numerous food stalls. It reminds us that we are hungry. 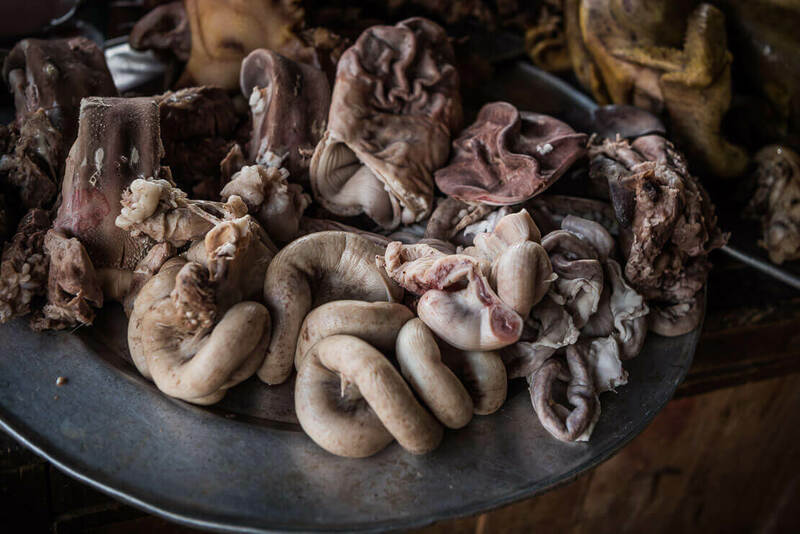 Plenty of food is being cooked and eaten everywhere, and some sights and smells aren’t for the faint-hearted. 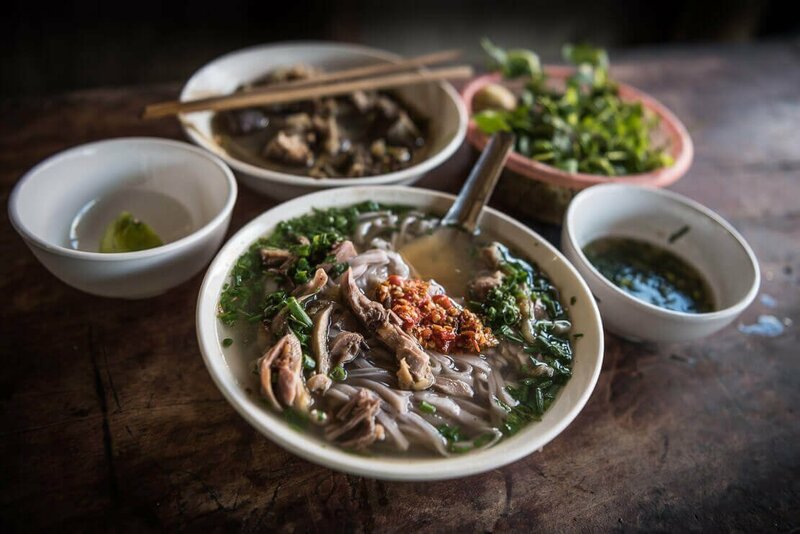 Many food stalls are selling noodle soup with pink-coloured noodles, or sour noodles, a local speciality from Bac Ha. Another interesting dish is Thang Co. 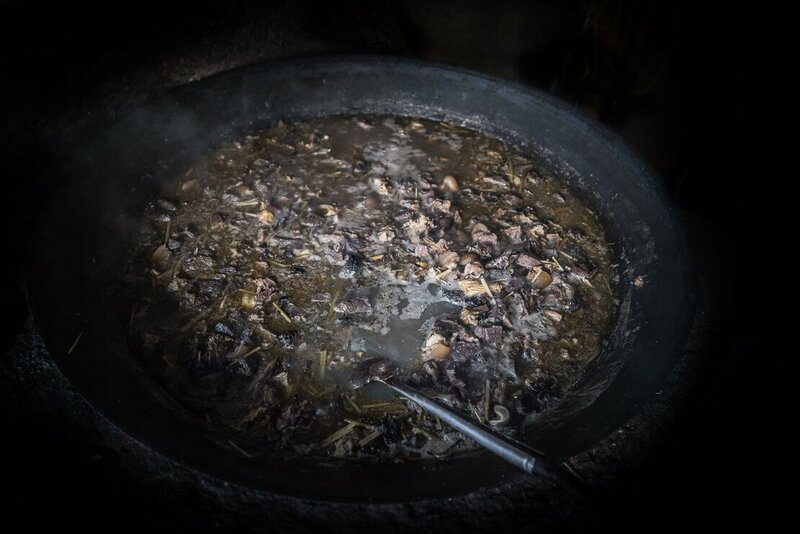 This traditional Hmong dish, cooked in a giant pot, combines all kinds of innards, bones, fat and meat (beef, pork, buffalo or horse). In other words, the soup makes use of what was left of the animals after their best parts have been taken. We take our seats among the colourful locals. Olga, always eager to try something new, immediately gives a try to Thang Co. Well, definitely, the best parts of the meat have been taken… But the sour noodle soup is delicious! These pink-coloured noodles have a stronger taste compared to the usual white noodles, and give a soup a particular flavour. Once we sat around the table, we immediately attract attention of the locals. From nowhere, the glasses full of corn wine appeared in front of us, and we didn’t even notice how we ended up saying “Cheers” after a few glasses. We had a great time eating and drinking with the smiling locals, and trying to communicate with the body language. After several (too many) shots, Olga started worrying about the mountainous road waiting for us on our way to Bac Ha. But the road proved to be easier than saying “No” to the locals pouring more wine. We finally managed to get up from the table before our glasses were filled in again, and safely made it to Bac Ha. 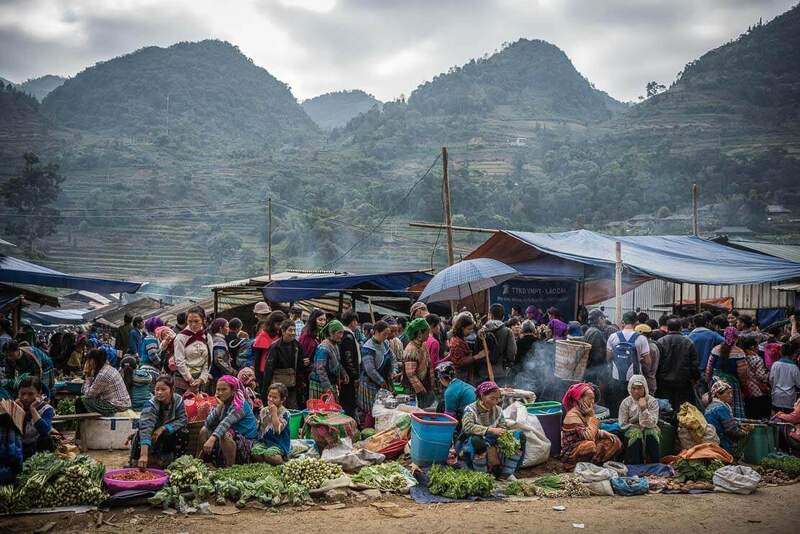 Can Cau market is smaller and lesser-known market than its neighbour, Bac Ha market. But this is what makes it special. 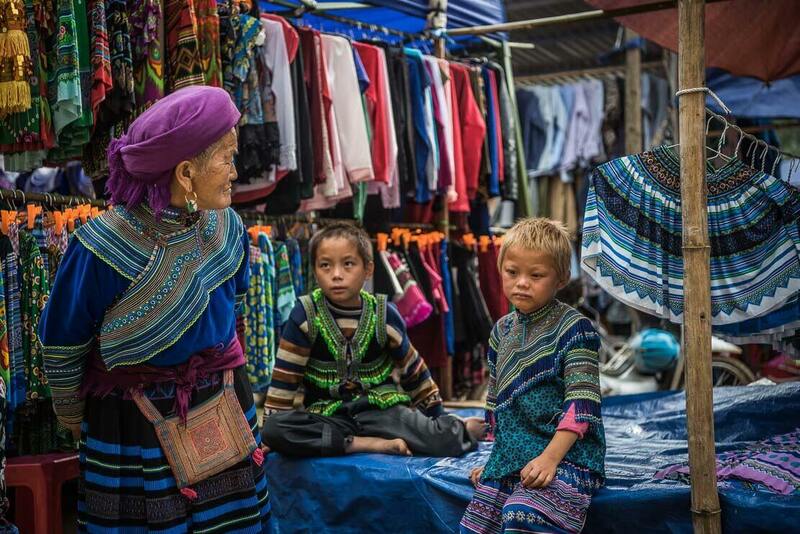 This is a local market for local people, a genuine ethnic minority market. Can Cau market used to be a remote market, rarely visited by tourists. 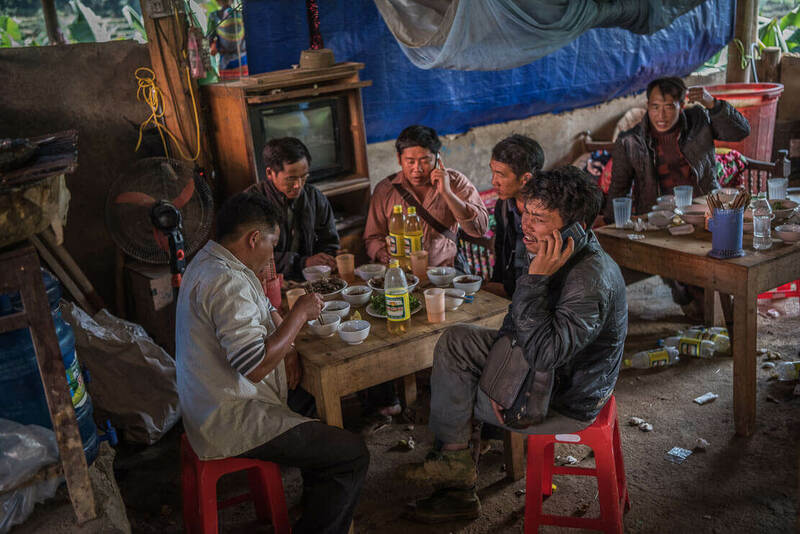 With the appalling condition of the road leading to Can Cau, only a handful of hard-core motorbike riders, in search of off-the-beaten-path places, used to make it through. 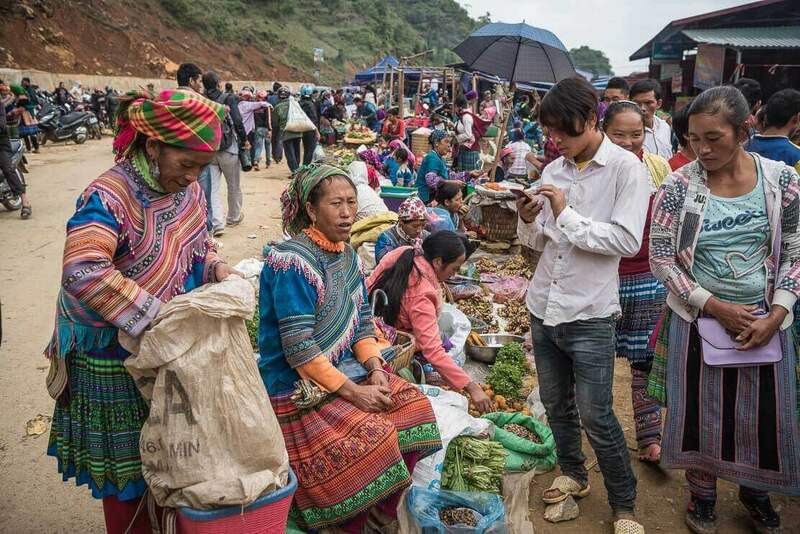 Now, with a new paved road built between Bac Ha and Can Cau, the market sees a growing number of tourists. 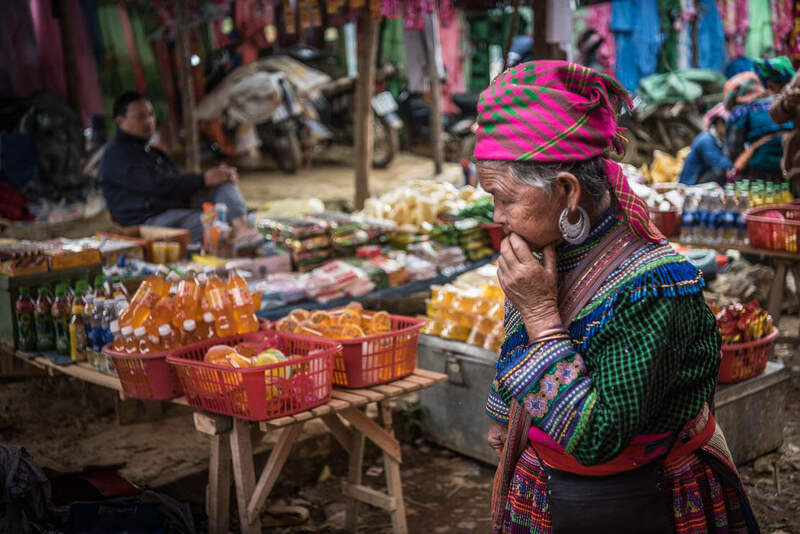 However, it remains a local traditional market, full of colour and culture, with its rural atmosphere and friendly ethnic minority people. Dates: Can Cau market is held every Saturday, from 6 am (people start coming before 6 am) till about 1-2 pm. 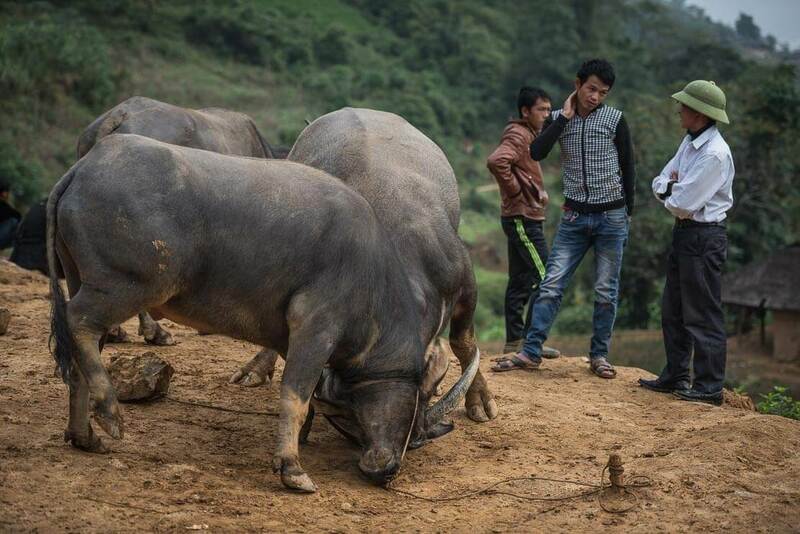 Location: Can Cau market is located in Can Cau village in Lao Cai province of northern Vietnam. It’s located 20 km north of Bac Ha town. 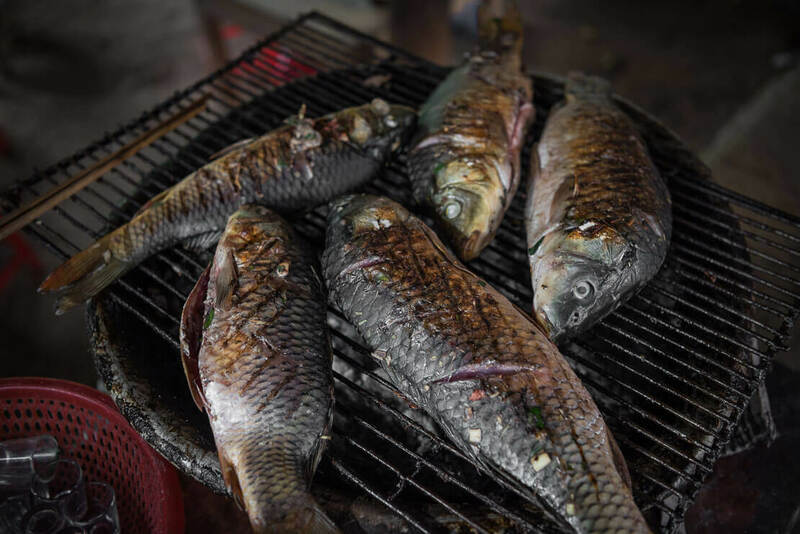 How to get to Can Cau market: The best way to visit Can Cau market is by motorbike. 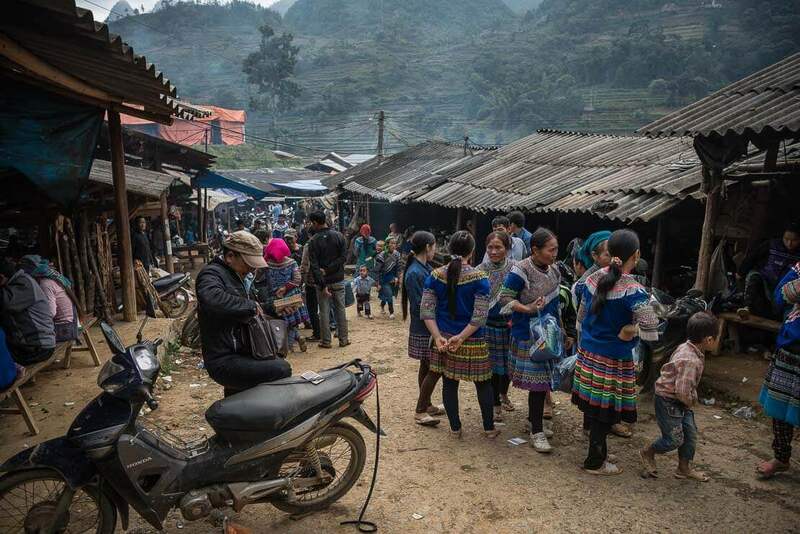 There are also public buses between Bac Ha and Si Ma Cai, which stop at Can Cau market. On a newly built paved road, it takes about 30-40 min from Bac Ha town to Can Cau (about 20 km). If you stay in Si Ma Cai, it’s only 6 km from Can Cau market. 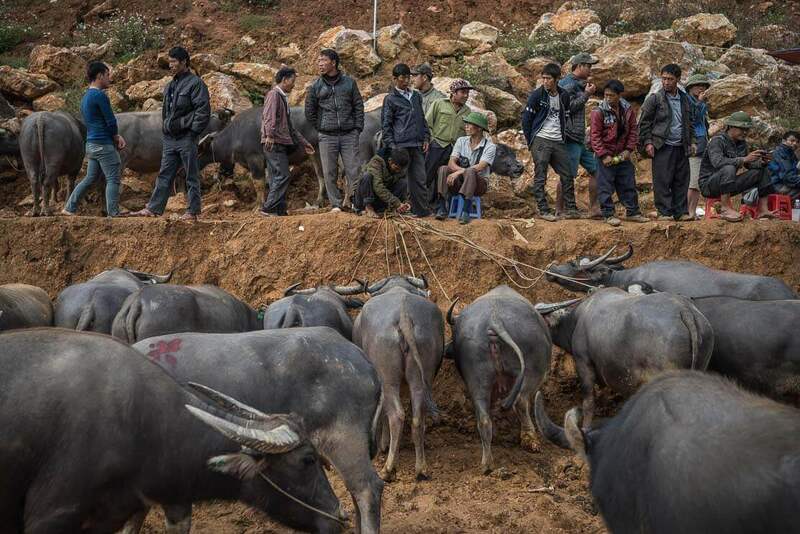 If you drive from Lao Cai, it’s about 2h drive (about 90 km). 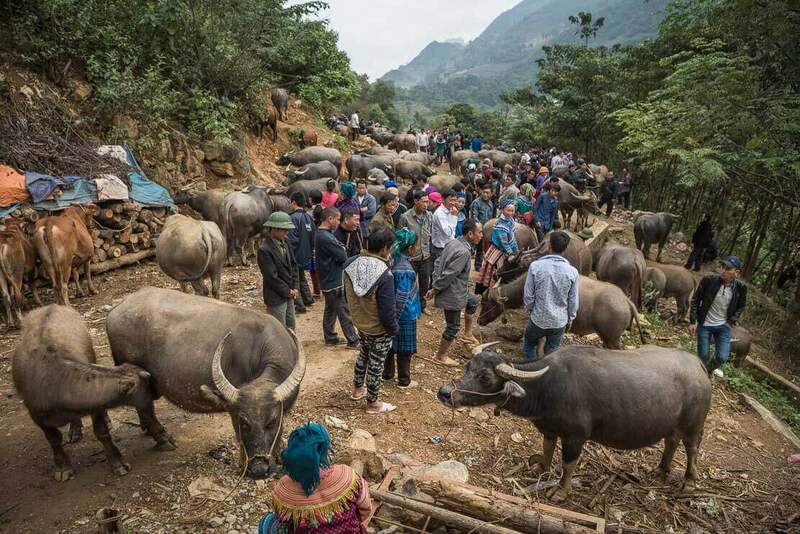 There are also public buses between Lao Cai and Bac Ha. 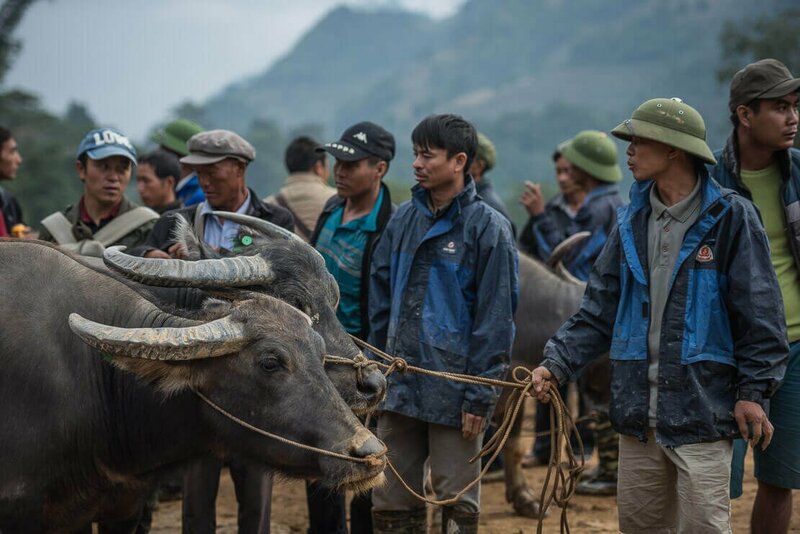 Where to stay: Many people stay in Bac Ha as there is no information available on Internet about accommodation options in Can Cau. 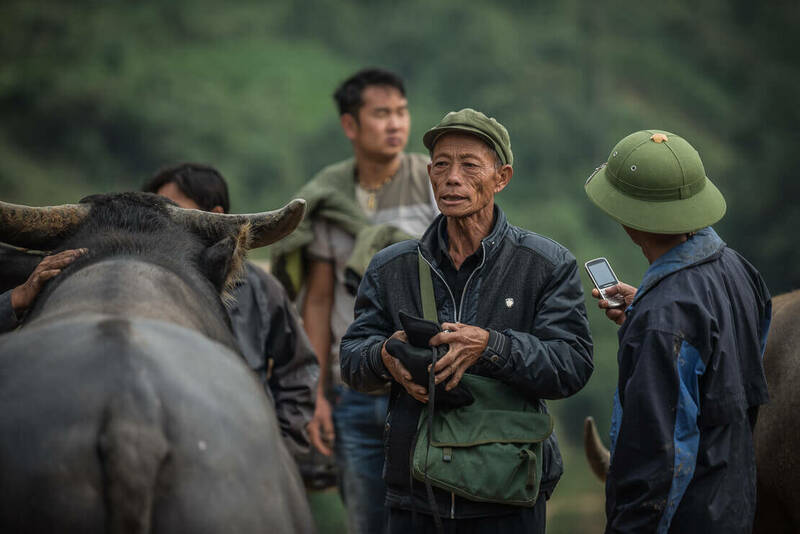 Although there is no accommodation available in Can Cau itself, there are a couple of hotels in Si Ma Cai located 6 km past Can Cau when driving from Bac Ha. 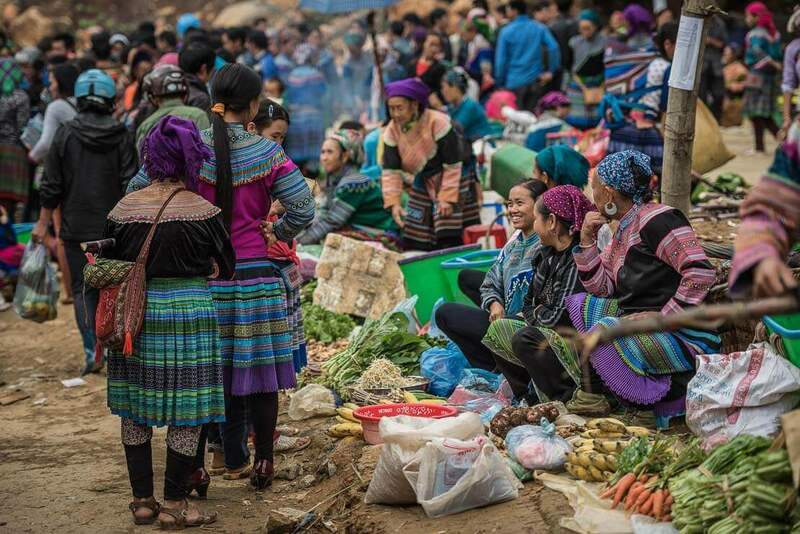 If you want to come to the market very early in the morning, it makes sense to stay in Si Ma Cai, which is much closer to Can Cau market than Bac Ha. There is no need to book accommodation in advance, however, if you prefer to have a peace of mind, the best site for booking accommodation in Asia is Agoda Agoda.com but it’s always a good idea to consult Booking.com. 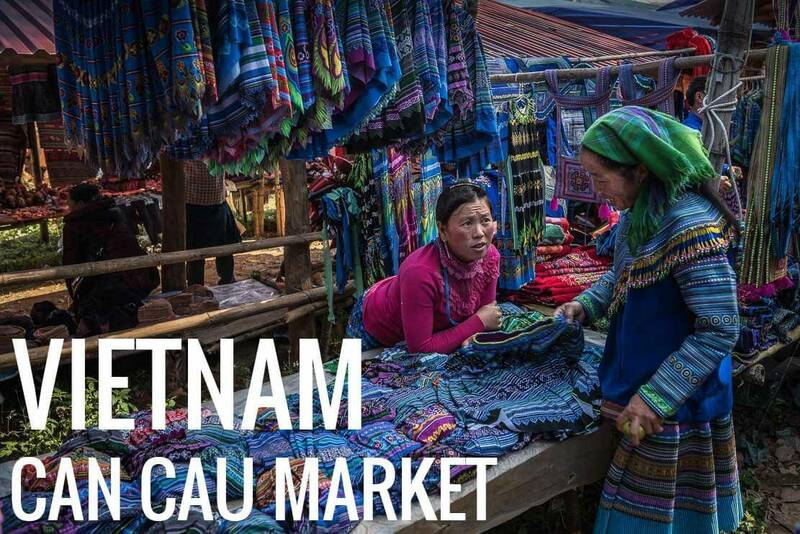 Additional information: The visit to Can Cau market (on Saturday) can be combined with the visit to Bac Ha market (on Sunday).